Holy heck, everyone, Apple just announced new iPhones, and for the first time in years, they actually look new and different. The big headliner is the iPhone X (pronounced “iPhone Ten”) while the appearance of the iPhone 8 surprised some fans. Less surprising were upgrades to Apple TV and the Apple Watch. But seriously, today’s big event was an iPhone show. The announcement didn’t just stop at new devices. Apple executives showed off a number of new features and components that make its new iPhones and Watches extra special. We won’t know for a while which of these new technologies makes its way to other Apple products like iPads and MacBooks, but it’s a safe bet that some of them will. So we’ve compiled a perusable list of everything Apple announced today. Read it with relish, as some of this stuff will be available very soon. This was the “one more thing” device. Everybody knew a Tenth Anniversary iPhone was inevitable, but it was still a thrill to get our first glimpse at the slab of stainless steel and glass. In addition to a nice glossy design, the iPhone X comes with an all-new Super Retina OLED display that stretches to the very edge of the device. That means that the Home button is gone and replaced by an upward swiping motion. Touch ID is also gone, replaced by something called Face ID. This facial recognition feature uses an array of sensors on the front of the device to map your face and unlock the phone, as soon as you look at it. The iPhone X comes with a new, ultra-powerful A11 Bionic processor that sports a neural engine, apparently designed to handle the intense computing load of Face ID. The dual lens rear camera is also improved with a new, larger 12-megapixel sensor and comes with dual optical image stabilization. The fancy front-facing sensors also enable fun new expression-based tricks like Animoji, an animated emoji application that Apple built for people who want to look like cartoons. On top of all that, the iPhone X supports wireless charging. The iPhone X starts at $1,000 and will be available in white and space gray. Preorders will begin on October 27th, and the device will start shipping on November 3rd. It’s unclear if rumors of a supply shortage will ruin the holidays for hopeful iPhone X owners, but we’ll see! As mentioned above, the new iPhone X ditches Touch ID for Face ID, a fancy facial recognition system. The idea behind Face ID is relatively simple, though the technology required to pull it off sounds dreadfully complicated. Basically, you look at your phone, and it unlocks. That’s it. In order to improve security, however, Apple went to great lengths to ensure that Face ID would recognize your face and your face only, both in light environments and in poorly lit ones. To accomplish this, the company built something called the TrueDepth Camera System for the frontside of the iPhone X. 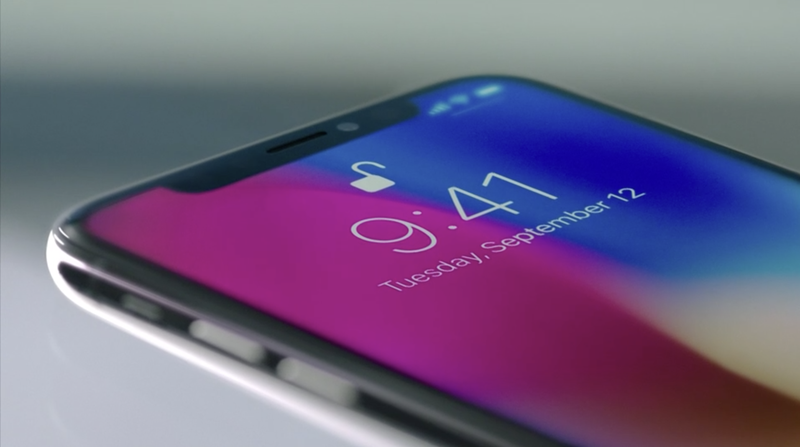 Along with the the proximity sensor, ambient light sensor, microphone, and front camera that have appeared on previous iPhone models, the iPhone X also includes an infrared camera, flood illuminator, and dot projector. These sensors create a 3D map of your face and compare every glance with that map using the neural engine in the new A11 Bionic processor. Apple claims there’s a one-in-a-million chance that someone else could open your phone. Face ID will undoubtedly come under scrutiny, since Apple promises flawless security. So until it’s been tested, we won’t know how secure it is or how well it works. The idea of opening your phone—or any device—with your face is certainly appealing, however. We’ll have to wait and see if Apple got it right. While a lot of people expected Apple to reveal an iPhone 7S and an iPhone 7S Plus today, instead we got an iPhone 8 and an iPhone 8 Plus. It boasts a new design that’s not quite as radical as the iPhone X overhaul but sounds rather luxurious. The front and back are now super strong glass, and there’s an aluminum band that wraps around the edge. The overall form factor still resembles the iPhone 7, but the all-glass approach is sure to give the device a pleasant heft. The guts of the iPhone 8 actually sound pretty comparable to the iPhone X. There’s an A11 Bionic processor, a Retina HD display, and several improvements to the camera. Those include that new 12-megapixel sensor and a new color filter as well as a new Portrait Lighting mode for the iPhone 8 Plus and its dual lenses. The iPhone 8 also comes tuned for augmented reality applications, though we didn’t see too many examples of what those might look like at the event. And, like the iPhone X, the iPhone 8 will support wireless charging. The iPhone 8 lineup comes in three colors: white, space grey, and a new gold finish. The iPhone 8 starts at $700, while the iPhone 8 Plus starts at $800. Preorders start on September 15, and the new devices will ship on September 22. Up until now, you’ve needed to tether the Apple Watch to a smartphone in order to get connectivity. With the Apple Watch Edition 3, those days are over. This updated wrist computer comes with LTE service that lets you connect directly to your carrier anywhere there’s cell phone service. You can finally place calls with only your Apple Watch—because I know you’ve been dying to do that! The Watch itself is almost identical to past watches, which is actually an accomplishment since Apple had to squeeze new hardware into the case. There’s a new dualcore processor that promises better performance and efficiency. There’s an electronic SIM that gives you a cellular connection. There’s also a new W2 wireless chip for better Bluetooth connections. On the software side of things, the Watch’s heart rate monitor will offer more details information in the Edition 3, an upgrade that might just save your life one day. The new Apple Watch Edition 3 comes in all the same colors as the old Apple Watch, although there is a new grey ceramic color and a buttload of new bands. The Edition 3 starts at $400 with cellular service and $330 without. Preorders start September 15th, and shipping starts September 22. This one’s easy and, some might say, very overdue. Apple TV, formerly an HD-only affair, will now support 4K and 4K HDR content. That means all those Planet Earth episodes that looked simply awesome in 1080p HD will soon look absolutely mind-bending in 4K with HDR10. The new Apple TV hardware looks the same from the outside, but new guts make the jump to 4K possible. There’s now a six-core A10X processor, the same one that Apple puts in the iPad Pro, as well as 3 gigabytes of RAM to keep the little black box humming. But that’s basically it. The new Apple TV still uses the same Siri remote that the last edition did. What’s especially cool about the new 4K support, though, is how Apple’s dealing with the switch in the iTunes Store. Now, 4K content will cost the same as what its HD counterparts cost in the past, and if you have HD purchases, Apple will upgrade them to 4K for free, if available. There will also be a host a new and improved games coming out that take advantage of the beefed up hardware. The new Apple TV starts $180 for a 32-gigabyte model. Preorders start on September 15th. Shipping starts September 22nd. Now that the new iPhones support wireless charging, Apple wants to make it easier to charge all your devices at once. So, at some point next year, Apple will release a new charging standard called AirPower. You can plop an iPhone, an Apple Watch, and AirPods on a little white platform, and they’ll magically charge. How will it work? We don’t know because Apple didn’t say so. When will it come out? Also unclear, though Apple broadly says 2018. Will it be cool? Maybe! Look at all this Apple stuff!